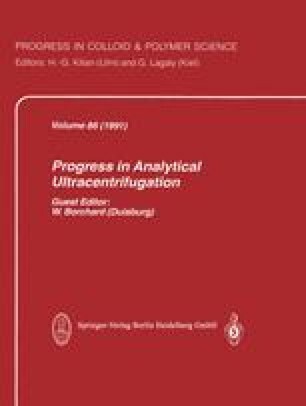 Analytical ultracentrifugation has been used to characterize the solution properties of latices from emulsion polymerization. For that purpose, latices have to be taken over into a thermodynamically good solvent, and the distribution of sedimentation coefficients (s-values) has to be measured, consisting of high s-values due to swollen particles and low s-values from soluble macromolecules. From that, the portion of soluble macromolecules and swollen particles is available and from the s-value of the swollen particles their degree of swelling can be determined from fresh latex samples.